Hotel Grand Shiva a luxuriant hotel located in the heart of holy city Haridwar. The exuberant hotel features spacious rooms, tasteful furniture, vibrant interiors and concierge staff who is always at service. The pleasant ambience of the hotel attracts bag packers, families, corporate personnels and leisure seeking travelers. 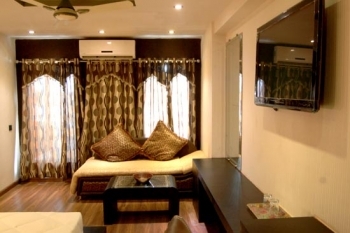 The fully furnished hotel is well equipped with modern amenities and state of the art technology. Those who await their stay at the stately hotel visit it again and again for cherishing the lovely memories spent here. The hotel is nestled with love in the holy city of Haridwar. The hotel is situated on Delhi-Haridwar Road at Shankar Ashram Chowk. One can easily reach Haridwar as it is well connected to cities such as Chandigarh (205km), Delhi (210km), Dehradun (59km) and Nainital (223km) through a good network of roads. The hotel offers accommodation in well appointed air-conditioned rooms and suites as per the requirement of the guests. The elegantly designed rooms are classified as Presidential Suite, Family Suite, Royal Room, Premium Room and Deluxe Room. Each room is exclusively designed to offer a royal treatment to the guests. All of the rooms possess tasteful decor, remarkable interiors and are fully equipped with excellent amenities to offer a comfortable stay. The multi cuisine Kusum restaurant of the hotel seves freshly prepared authentic cuisines. The guests can feast on delectable Indian, Chinese and Continental cuisines which are prepared by the experienced chefs. Having food at the warm and friendly ambience of the hotel is exhilarating. 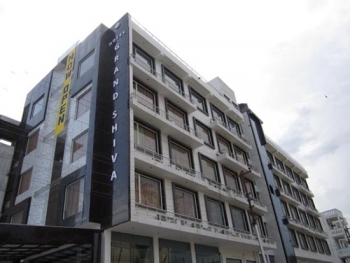 Hotel Grand Shiva is situated in the holy city of Haridwar in Uttarakhand. It is located at Shankar Ashram Chowk at Haridwar-Delhi Road. Haridwar being a famous pilgrim place has a great connectivity of motorable roads from various destinations in India. State owned buses as well as private buses operate from Delhis ISBT Kashimiri Gate to Haridwar. Railway station and bus stand are located close to the hotel at a distance of 200 metres only. Haridwar is well connected with railways by metalled roads from major cities in India. Jolly Grant Airport is the nearest airport from Haridwar. It is well connected to Delhi with daily flights. Taxis are easily available to Haridwar from Jolly Grant Airport.